Come to Camelback Ford today to see why new drivers are turning toward efficient SUVs and crossover vehicles, like the Ford EcoSport. The EcoSport line is meant to be somewhere in between a car, van, and truck. While the EcoSport gets good gas mileage and can fit into a parking spot, it also has decent cargo space and semi off-road capabilities. The EcoSport comes with a huge amount of cargo space in the trunk and backseats. Both backseats can be folded down to create even more room. This is one of the major selling points of the Ford EcoSport. In addition, the safety features on the EcoSport are best in class - all of the features of a more expensive Ford are included. 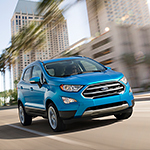 Check out the Ford EcoSport. Visit our showroom in sunny Phoenix, Arizona today!